We adopted a new cat a couple of weeks ago. We were looking at kittens at Petco in the top cages and this sweet girl in the bottom popped her head up. We pet her through the cage and was loving the attention and purring very loud. We went home and I couldn't stop thinking about her. The next day we went back and got her. She is getting along with Oreo pretty well. There was a little bit of hissing in the beginning, but now they greet each other and touch noses. I finished an autumn design for Plum Street Samplers. 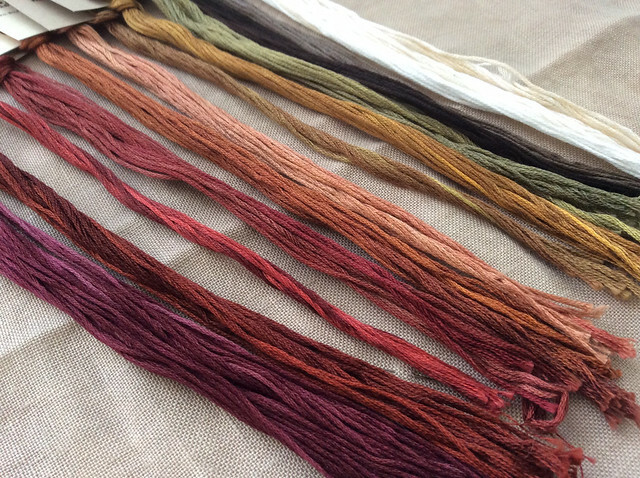 I can't show you the design, but I can show you the pretty thread colors. I started a sock using Lorna's Laces Shepherd Sock Multi (Cool Colorway). The pattern is Vanilla Latte Socks. I'm using size 1.5 dpns. Next, is my Shepherd's Bush Fold project. I finally got all the grass filled in and started working on the top portion. I finished the cat on Charlotte Clayton and I also got Isabella Fox back out and worked on it a little bit, but what I really want to get back to is Plum Street Antique's "Crown Sampler." I just love this one! I need more time in my day too!! What a sweet kitten. I can't wait to see what you sttiched for Paulette , those colors are very pretty! Just love the colors for the new Plum Street, can't wait to see the actual piece. 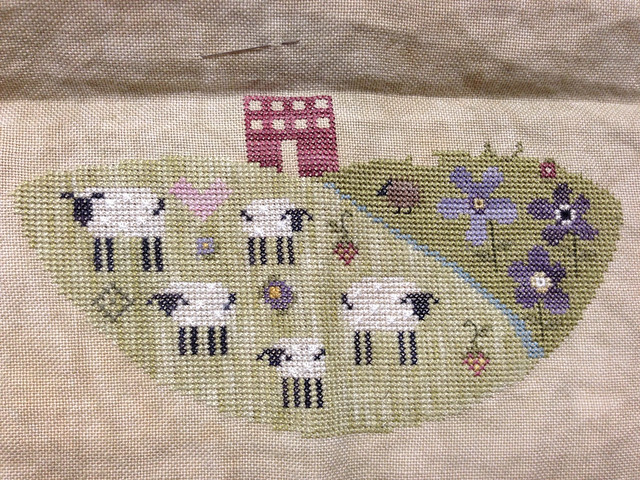 The stitched sheep are so cute. Love the specialty stitches (can't see which one exactly in the picture) they give it real character. She's a beautiful girl. So glad you rescued her. Wow, those colors have me excited to see the new design. Fabulous palette! I just love the Crown sampler too. Can't wait to be able to start mine. LOVE your Kitty, she is so pretty! Her eyes...gorgeous! Love everything, from your SB to your sweet sampler! She's just so cute! Who could resist? Ginger is a pretty cat. I'm glad she and Oreo are getting along. Love your stitching and your knitting too! Precious kitty! Love your projects!! Gosh your knitting is so uniform and tidy! What a bonnie little cat, such a lovely mix of colours and markings. 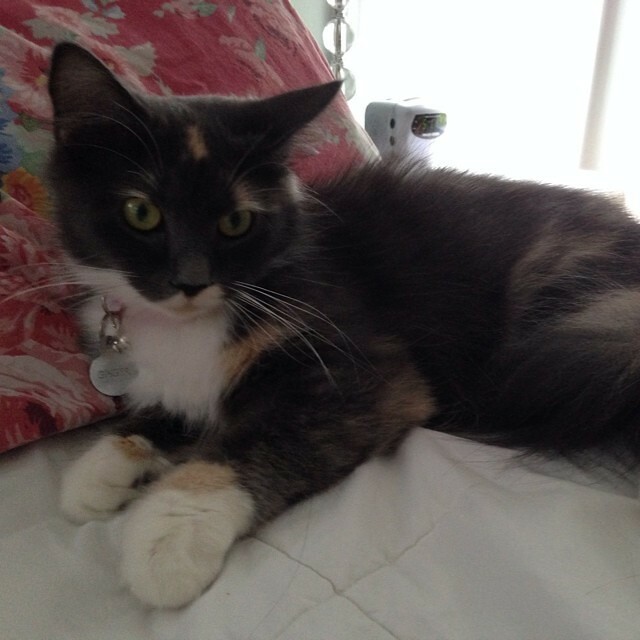 Getting pets to accept newcomers isn't always easy, I've had mixed results over the years. 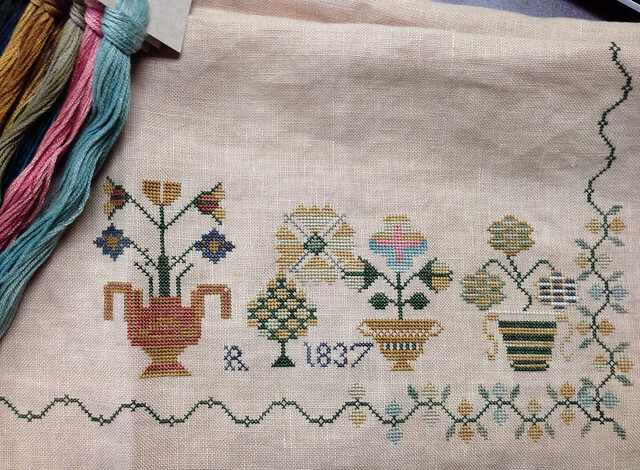 Lovely stitching - a really appealing mix of designs you're working on. Ginger is a cutie!! Love your crown sampler, the colors are beautiful! Don't we all need more time! Love, your new kitten, she is beautiful! What a beautiful kitten! I am happy you decided to adopt her. Your stitching is lovely. Ginger is such a cutie! I'm glad she's fitting into the family. She looks sweet. Love everything you're stitching and knitting! Time ... don't we all! :) Beautiful stitching. Ginger looks such a sweetie. I totally need more time in my day. I miss stitching so much! Love your Fold and Crown stitching and the knitting looks soft and cozy. Ginger is a total cutie! I have a soft spot for calicos and she looks so soft and fluffy! What a sweet kitty! Lovely stitching as well! What a cutie pie that Ginger is. Glad you were willing to take her home, and that Oreo is coming around. Lovely stitching and knitting, as always! The PSS Crowned Bird is also a beauty! I'm not a cat person, but Ginger is ADORABLE!!! Love all your stitching too!! Love the new kitten! So cute! Great WIPS going on. I still love that cat on Charlotte. Such a cute Kitty. Beautiful stitching. 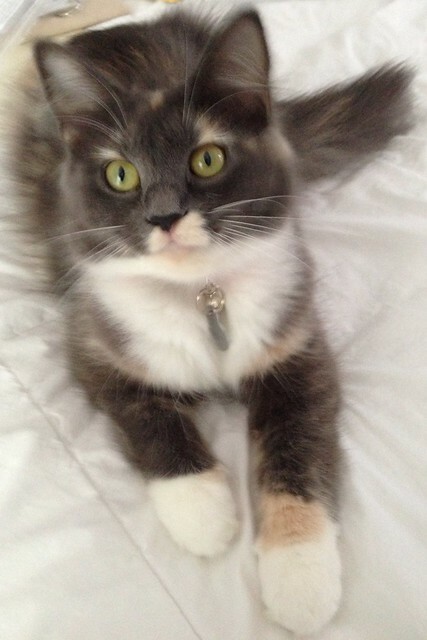 Nicole your kitty is such a beautiful little girl and she has such a good home with you too! I am so happy for you. 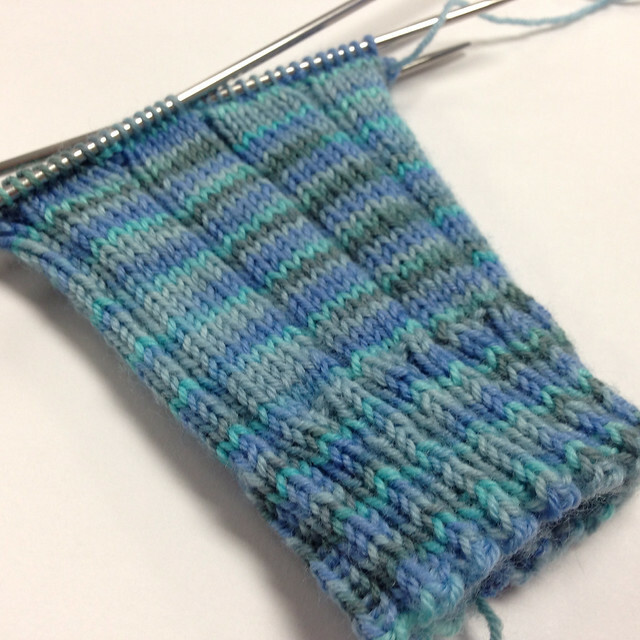 Love your photos of your stitching and love the sock you have started doing as well. I am trying to learn more about knitting socks and there are so many things out there to see. Your socks are the prettiest ever!!! Love your stitching photos too! !